KUTZ have invested in the very best washing and drying equipment in order to make the experience for your dog as stress free as possible. We only use professional products for the finest results. Of course we recognise that there will be times when you wash your dog yourself but for a truly healthy dog we would recommend a professional session with an expert every 8 weeks depending on the breed. You will be surprised how competitive our prices are!!! Why not give your dog a treat after his kennels stay with a wash and blow dry? You can request this when you booking your dog in. Owners requiring transport for their dog to the groomers and back home can arrange this when they book. There is a charge for this service on a mileage basis. You can contact Lisa at the parlour on 01698 828555. Please see below for price list guidelines. 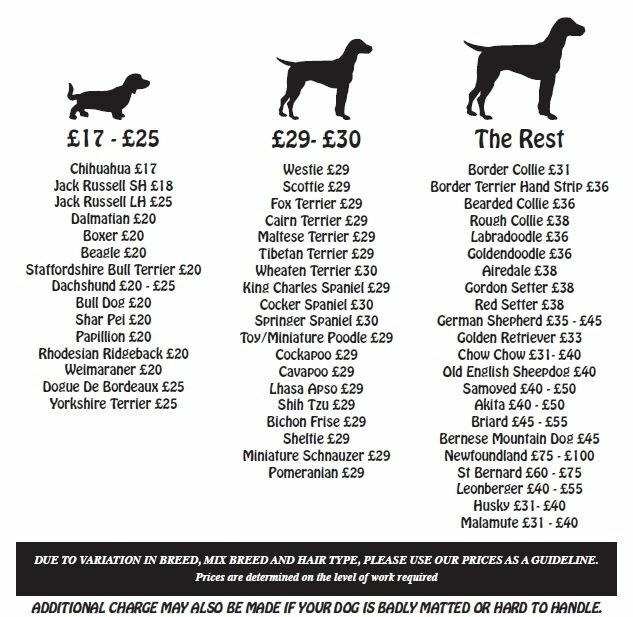 Due to variation in breed, mix breed sizes and hair type, please see our prices as a guideline. Prices are determined on the level of work required. Additional charge may also be made if your dog is badly matted or hard to handle.